Your Lodging rate includes1 assigned dock slip for your boat and use of our boat ramp. If you plan to bring your own motor to use on one of our resort boats, please verify it will fit on our boat. Our 14' boats allow a maximum15 HP or smaller motors. Advance notice is required to rent one of our boats- see fee schedule below. All water equipment must be docked prior to sunset (sunset times are listed in the MN Boating Regulations booklet). See rates below for non-motorized resort boats and/or extra dock spaces. All boating arrangements require 7 day advance reservation or authorization prior to your arrival. Our boat rentals are not available for tubing or skiing. Please request a dock space here when renting a boat at a local marina. Note: No Tubing, No Towing, No Skiing allowed. Rental Lease required. Minimum age 18+ to drive. Must be docked at assigned dock slip prior to sunset. 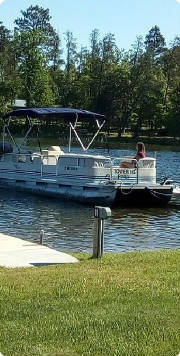 Non-motorized 14' Resort Boat & dock slip: $100 + MN Sales Tax (1 time fee/unlimited consecutive use during your stay with us) . Lease required. Extra Dock Slip for your boat: $10/day or $50/week + MN Sales Tax. 7-day advance notice required to add or cancel dock slip requests.